Review of Fullers London Porter | Beer Apprentice - Craft Beer News, Reviews, Interviews and Info. Tonight, I’m going to review another beer from the Fuller Smith & Turner PLC Brewery from London, England. I have already reviewed a couple of Fuller’s on here, but I had to give this one a go because it was sitting in my fridge just staring at me wondering why I had neglected it. Well…. it shall wait no longer. I’m speaking of the Fuller’s London Porter. I’ve had this beer a few times, but it’s been a couple of years since I last had it and I have never given it a proper review. I do remember liking it however, so that’s always good I guess. The website, fullers.co.uk, had this to say about the Porter. Fuller’s London Porter, is widely regarded as the World’s Finest Porter: having won awards all over the world, London Porter is regularly voted the number one Porter on beer websites such as www.ratebeer.com, a tremendous accolade to our brewing team. The origins of Porter date back to London in the early eighteenth century, and the beer has seen fame around the world, from Ireland to the USA and Australia. It was the dominant beer style in London for quite some time, and takes its name from the street and river porters of the city who carried good around the streets. Let’s give it a pour and a taste and enjoy this well made brew. 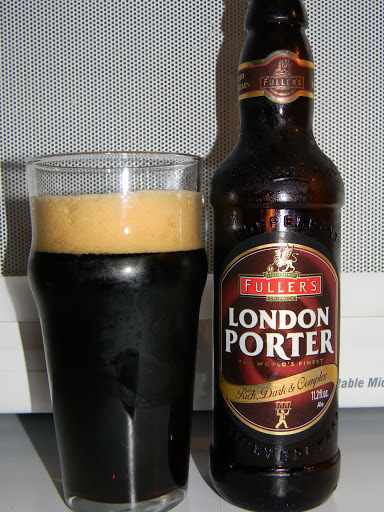 The Fuller’s London Porter has an ABV of 5.4% and came in an 11.2 oz. bottle. This beer appeared a dark black color on the initial pour, but as I held it to the light it had more of a very dark ruby color. It was clear and really let off a nice, neon, ruby sheen. A wonderfully sized head was formed that was creamy, cream colored, fluffy and smooth. It had well above average lacing and retention. The aroma had a rich and sweet malt backbone. Coffee and chocolate notes were balanced very well together. Neither were particularly robust, but rather they sat right in the middle for excellent interpretation. A very slight hint of cream and “lard” hid just underneath the coffee and chocolate notes. A touch of nuttiness with no real hints of dark fruit, of which I thought I might find. At the furthest depths of the nose I smelled a very faint smokiness. The overall bouquet was complex with lots of character. The taste brought out more of the rich, dark chocolate. The coffee was hidden at first, yet started to develop as the liquid moved across the palate toward the back of the throat. It’s like a nice, roasted coffee bean type of flavor. A milky cream mixed together well with the chocolate and coffee to round out and round “off” the flavor profile. Some bitterness was there, but it only added a little tickle because the roasty, toasty malt is what characterized this brew in my opinion. Very well balanced, robust and even. It tasted really good. The mouthfeel was medium to medium/full. Smooth, creamy, chewy and, believe it or not, somewhat refreshing. I found myself thirsting for more with each sip. A nice bit of flavor was left behind on the palate. Especially the roasted coffee. This beer reminded me of why I love Porters so much. Wonderful toasted, roasted aromas and flavors. A great mouthfeel left me wanting more and more. I was literally taking huge gulps. I couldn’t help it. I was just in the mood for a great malty beer I guess. I haven’t had a Porter in a while and I’m sure glad I started back with this one. Very good all around. It was kind of filling and it seemed to stick to my ribs. I liked it!!!! If you haven’t tried this beer….. pick it up. It’s definitely worth it. What’s the best Porter on the market today in your opinion? Thanks, as always, for reading and commenting guys.